Many before him must have dreamt of riding around the Italian countryside on a classic Vespa, soaking up the culture and the sun. But Peter wasn’t scared to take the leap and make it happen, heading off to Italy in search of La Dolce Vita! Vroom with a View is his account of Italy from the saddle of his 1961 Vespa, named Sophia. A funny, fast paced read, Vroom makes perfect summer reading, either on one of our painting courses, cooking holidays or Pilates retreats or as inspiration for that next trip. Peter has been nominated for our Best Italian Summer read award, why not vote for him by following this link? Peter was kind enough to let us interview him, telling us his thoughts on solo travel and why Italy should be on the top of your bucket list. Q1 You’ve travelled a lot of places solo, do you have any top tips for the adventurous traveller? Be open to new people and new experiences. Put yourself out there and resist the temptation to hide in your hotel room. You have an advantage as a solo traveller in that locals are more likely to come up and speak to you than if you travel as a couple or in a group. Sometimes they’ll invite you into their home or tell you about some place not mentioned in a guidebook. They may invite you to share a meal. My advice is to go with the flow and see where it takes you. Of course, that advice comes with a heavy caveat. While most people you meet will be legit, there are dodgy folk out there you should avoid. How do you know? Listen to your gut instinct. If something feels a bit wrong, it probably is. Q2 How much planning was involved in the trip, how much was get up and go? Oh, it was la get up and go. 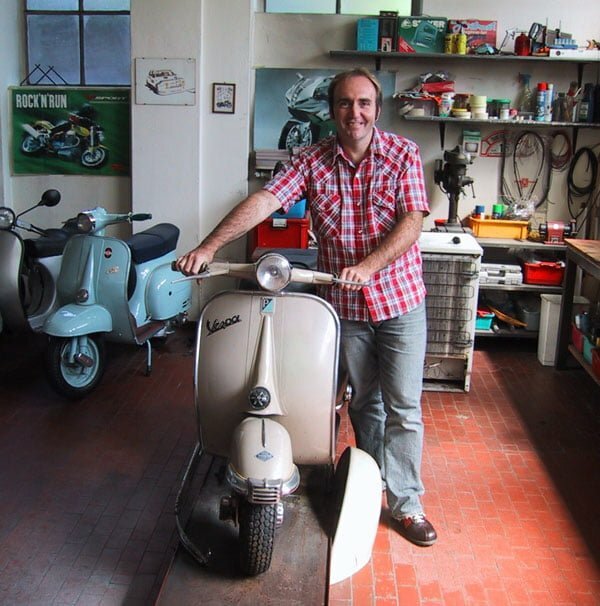 Especially after I’d bought my Vespa on eBay Italy and had to get to Milan (from Sydney!) to pick it up. To be honest though, that’s how it is with all of my trips. I usually pick a Point A and a Point B – in this case, Milan and Rome – and then just go with the flow. That worked particularly well on this trip because a) I could only go on B-Roads on a 125 cc Vespa and b) my little Vespa kept breaking down and Italians were pathological in helping me! Q3 Vroom with a view and Vroom by the Sea have meant you have seen a lot of Italy, Do you have a favourite city or area? There are so many stunning parts of Italy, you’d be hard pressed to be disappointed – or not eat well! But as with all travel, I find it is the people you meet that determines your favourite places. On my Vespa adventures I was really lucky to meet some great people, some of whom are still very good friends (I actually caught up with Filippo, a.k.a. The Waspmaster, in London, just last weekend.) Hence I have a soft spot for Livorno. As I say in the book, it’s the kind of place you’d drive right past, but hanging out with Filippo and Marco I got to go to the most amazing bars and restaurants and quirky little festivals and introduced into their circle of friends. Having said that, I did really enjoy riding around Rome with Sally, pretending we were in Roman Holiday. Q4 You find your way to France’s Mayes villa, was it her writing which sparked the love interest with Italy, or something else entirely? I thought it [the villa] would be like the one on the cover – you know, on a low hill, surround by fields, and the classic long dirty drive lined by cypress pines. It’s tucked away at the back off Cortona, a quick sizeable town. Still, I don’t think you can read the book and not want to go to Tuscany. Q5 Did you have any expectations about Italy before you arrived, did they change once you got on the road? Funnily enough, I was concerned that by riding around on a Vespa keeping the country at arms length. On all my previous trips I’d travelled by public transport and couldn’t help but be thrown into peoples’ lives and amazing situations. Would I just buzz through the country in a bit of a bubble? In the end, I had totally underestimated how much the Italians would love my little old Vespa and the fact that I was a crazy enough to ride it around their country. It opened so many doors for me – and not just because it kept breaking down. One thing that was as I expected: it was a brilliant way to see the country. I could feel the sun on my skin, smell the freshly cut hay, stop for picnics in picture postcard settings, even get an adrenaline buzz scooting amongst the manic traffic on the cobbled streets of Rome. Q6 Europe is a long way for Aussies to travel, it can be tempting to try explore it all at once, any advice for why Italy should be first on the list? I think Italy is the perfect package – great food, great weather, amazing history and art, and relatively compact (from an Australian perspective at least.) And then there’s the Italians themselves. I think their attitude to life and, shall we say, genial disregard for authority, sits well with how Australians view life too. Do you feel inspired and would like to experience authentic Italy yourself this year? Then contact us today and find out more about our holidays!